WHAT DID THIS PATIENT HAVE TO SAY ABOUT HER RESULTS? "My left breast began to become extremely firm approx five weeks ago……my left breast sat slightly higher than my right breast.. Both breast are now equal height. …my breast is now the same softness as my right breast.” -T.S. “Initially, I was in a lot of pain as breast was very hard. It is now very soft. I am very pleased with results.” -L.P.
" I will admit that I was very skeptical on my first visit, but at the end of my treatment I’m very happy and found confidence again. I went from having implant that was extremely hard and painful, to one that's soft, great position and incredible to look at. A world of gratitude to [Aspen staff] and the incredible team at Aspen for giving me my life back Thank you..." -M.A. RIGHT breast unnaturally high and hardening (Capsular Contracture). Also notice inside cleavage area of RIGHT breast is flat and lost natural contour. and contour of inside of RIGHT breast achieved. “After surgery therapy softened the implant quickly” -L.M. * Note: This patients outcomes were a combination of her surgeons adjustment of an expandable implant in conjunction to Aspen Rehabilitation Treatment. mispositioning and grade 3 Capsular Contracture. “After the surgery the breast remained hard, misshapen, and at an abnormal height in relation to the other breast. It has movement now and is much softer.” -M.S. baker 3 with UPWARD mispositioning. Improved position and softness . RIGHT breast Capsular Contracture and UPWARD misspositioning. Improved softness and downward position. 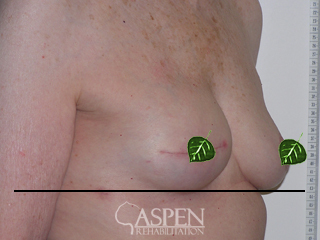 “...Referred to Aspen Rehab for Capsular Contracture of Right Breast…100% improvement [in softness]. Very pleased with treatment; right breast has dropped evenly with left breast.” - K.W. Capsular Contracture probably after a Hematoma and preventive Treatment initiated. “Intervention with treatment helped soften the breast + shaped it so the overall appearance is better. Never became hard due to preventative treatment at Aspen.” - J.P.
LEFT implant mispositioned and UPWARD cone-like shape. Baker 4 firmness. Upward LEFT breast baker 3 Contracture. Upward RIGHT breast baker 3 mispositioning and firmness. RIGHT breast firmness and shape distortion. RIGHT breast soft with equal shape and position. "Softness increased by 85-90%. Positioning is now equal. 100% satisfied. The staff is wonderful." - M.A. RIGHT breast firmness and upward position. RIGHT breast softer and improved position. "My breasts are dramatically softer and they are more even. 100% extremely satisfied. Would recommend highly as an alternative before surgery." -J.Y. RIGHT implant high and firm. RIGHT implant down and soft after treatment. "I have seen significant improvement/results as a result of my treatment at Aspen. Prior to my treatment my right breast was significantly higher than my left and much firmer. Aspen has also assisted w/the range of motion of my right arm. Prior to my treatment I couldn't raise my arm to reach across the table and now I can fully raise w/ almost no pain + discomfort. As an added perk the staff is absolutely wonderful." - J.M. Upward RIGHT breast mispositioning and firmness. Normal RIGHT breast position and softness. "I am very happy with my results. I can definitely see a 100% improvement and would happily recommend this place to any women with similar problems. All the staff was very nice and kind and reassuring that there is hope as long as you follow their instructions strictly." - D.A. Upward LEFT breast mispositioning and hardening. "...Happy with results and highly recommend this therapy!" - A.F. Notice undesirable upward repositioning of LEFT breast and start of hardening of implant capsule. Notice LEFT breast in normal position and normal softness achieved after treatment. "The visual appearance improved significantly. I can almost say it is perfect. The issue with the height is totally resolved." - AMR. RIGHT implant down and soft after treatment. Also note pt with resolved underarm tightness and chest pain. "I feel that the Right breast is maybe even softer than the other, which we are not even treating. Scar tissue has become much softer. I highly recommend the procedure they are now using...” - B.Q. Upward RIGHT breast mal-positioning and hardness Baker 3-4 after expander and implant reconstruction. BOTH breasts equal shape and position with 100% improved softness after treatment. “Before Aspen Therapy-Right side was visibly distorted-extremely hard-Now visually improved, softness achieved was 100%- I’m extremely pleased.” - S.C. Breast Cancer with Reconstruction. Notice undesirable upward repositioning of LEFT breast and start of hardening of implant capsule. "The appearance and height of my breasts are actually better than it has been since the reconstruction! My treatment at Aspen has been incredible ! I would have never have thought that I could have made such improvement! It is so important that this option be out here for patients." - D.P.K. Breast Cancer with Reconstruction on RIGHT breast with Capsular hardening and upward position. Improved shape, position and softness of RIGHT breast achieved. "Thanks to Aspen's care and instructions, my Right breast reconstruction has been brought to be level with the natural left breast. The reconstruction of the right breast after my mastectomy became very hard. Now it is much more soft and pliable. I felt very confident with Aspen's care." - A.K.